So anyway I usually wait for some event to happen with friends or family and then I pull out some sweet confection I have been waiting to do. So when my niece got engaged last month I was so excited because I knew there would be a bridal shower and I would get to do LINGERIE cookies. The party was last Saturday and my nieces sister in law threw a great bridal shower. It was a "stock the pantry" bridal shower. To help out the couple, we were assigned items to bring that would help stock their food/pantry shelves ie.. I got the Clorox wipes and duct tape assignment along with bringing a favorite recipe to help stock her recipe box. Well since it was not the typical personal bridal shower there would not be any gifts containing small amounts of fabric adorned with lace and ribbon. 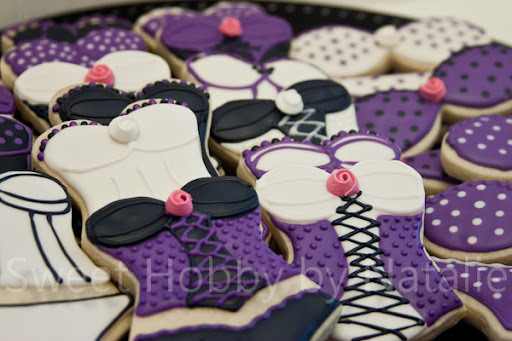 So perfect chance for me to sneak in Lingerie and I did it in the form of a cookie!!! 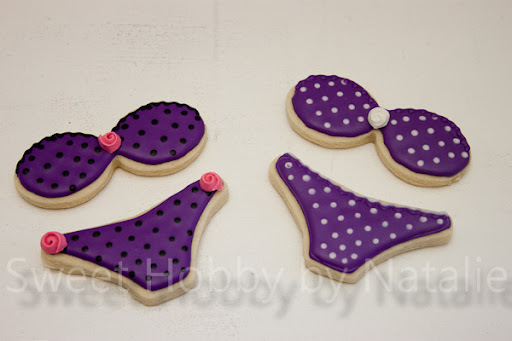 The images that I saw on the Internet that inspired me to make these cookies were designs from SweetSugarbelle, Songbird Sweets and Montreal Cookies! These were some of my favorites, I like the crisscross corset look. 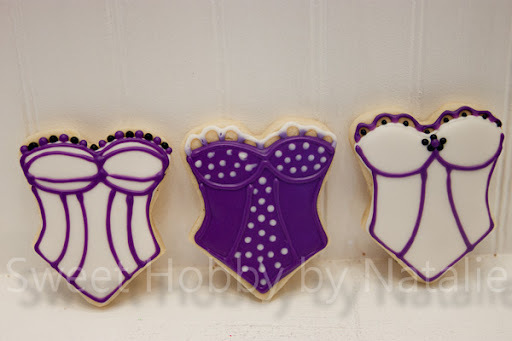 I had a lot of fun doing these and everybody loved them at the shower and it was funny to be eating lingerie! !